Giraffe for kids: Learn all about the tallest animal on earth. Giraffes are one of the most fascinating and different animals on earth. They are also the tallest animals on earth. They can be found in the wild in the savanna on the continent of Africa. How tall do they get? Giraffes are truly giant animals. They can grow up to 17 feet tall and weigh as much as 3,000 pounds. 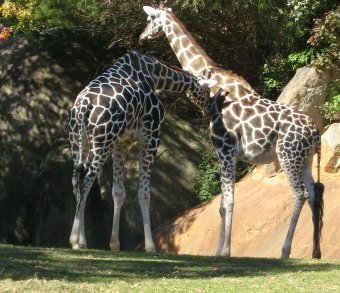 The male giraffes, called bulls, are typically larger than the females, called cows. The babies aren't exactly small either. A baby giraffe, called a calf, is 6 feet tall at birth! Giraffes also have large hearts. Their hearts can be up to 2 feet long and weigh over 20 pounds. They need these large hearts to pump blood all the way up their long necks. Although giraffes look ungainly, they are actually fairly agile and can run as fast as 30 miles per hour. Giraffes will fight if they have to, but will usually just try to outrun a predator. They often get a good head start on predators because they have great eyesight and get a good view of the territory with their great height. As a matter of fact, other animals know how good giraffes are at seeing predators, so they hang around with giraffes and, if they see the giraffes start to get nervous or take off running, they take off too. Giraffes are herbivores, meaning they eat plants rather than meat. 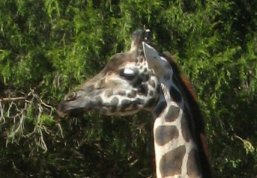 They use their long necks and tongues (which they can stick out up to a foot and a half!) to get to leaves on trees. Their favorite types of leaves are from the acacia tree. 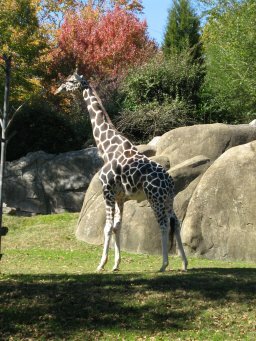 A typical full-grown adult giraffe will eat over 70 pounds of leaves, twigs, and fruit each day. Giraffes don't need to drink water very often because there is so much water in the leaves they eat. However, when they do drink water, they can drink several gallons at a time. This is good because a giraffe has to bend down and get into a vulnerable position when drinking. Not a good idea when there are lions sneaking around! What are baby giraffes like? Baby giraffes are called calves. They can walk within a few minutes of being born. Baby giraffes are very vulnerable to predators and many of them do not survive the first week of life. Their mothers do everything they can to protect them. They help them to hide in the grass and will fiercely try to fight off predators. Young giraffes grow very fast and can grow over 2 inches in a single day! They stay with their mothers for about 2 years until they are big enough to take care of themselves. Giraffes are not endangered, but many do live in protected areas. There are around a 100,000 giraffes in the wild today. At one point, however, they nearly became extinct due to hunting by humans. The interesting pattern of a giraffe's coat is likely for camouflage. At one time people in Africa called them camel-leopards because they looked like a combination of a camel and a leopard. When a giraffe baby is born it will fall five to six feet to the ground and typically land on its head. Wow, what a way to start things off! Newborns can stand within 30 minutes of being born and can run after about 10 hours. Despite their long necks, they have the same number of vertebrae as a human…seven.